Early childhood caries (ECC) is a virulent form of dental caries which affects the primary dentition of children below 71 months of age., A considerable proportion of the child population in both the developed and developing countries is affected by this multifactorial disease that can hinder the physical, mental, and social functioning of the child.,, Dental caries in primary dentition is a risk indicator of caries in permanent dentition. In spite of this, many parents do not seek dental care for their children. Dental anxieties in children can lead to behavior management problems such as refusal, crying, anger reactions resulting in avoidance of dental visits or attending dental appointments irregularly, often only when symptoms arise. This can affect the dental caries experience of the children. However, the relation between parental dental anxiety and dental caries experience is not fully understood in the preschool age group. Maternal anxiety can influence the dental fear of the child based on the responses of the mother regarding dental treatment., An earlier study found that 7 to 12-year-old children’s dental caries experience correlated positively with their mother’s dental anxiety., There is a lack of such a study involving preschool children. Preschool children are dependent on the mother for oral health related practices, especially for visiting the dentist. Hence, the dental anxiety of mothers may influence their attitudes and habits regarding the child’s oral health care, especially the dental attendance pattern. Based on this literature background, it was hypothesized that dental caries experience and dental attendance pattern of the child with ECC may be influenced by both child and maternal dental anxiety. The aim of this study was to explore the association of maternal dental anxiety and child dental anxiety with the dental caries experience as well as the dental attendance pattern of the child. This cross-sectional study involved preschool children between 3 and 6 years of age with ECC (as per the definition by American Academy of Pediatric Dentistry) and the accompanying mother who visited the dental clinic (Department of Paedodontics and Preventive Dentistry) for routine dental treatment. Children with a history of systemic diseases were excluded from the study. The sample size was calculated to be 227 mother–child pairs, assuming an association between the parameters as odds ratio of 1.5 with a difference of 0.3% and 10% margin of error, at 90% confidence interval, and 80% power of the test, using G-power 3.1.2 software (Heinrich Heine University Düsseldorf, North Rhine-Westphalia, Germany). Mothers of the patients were informed about the questionnaire to be completed and dental examination to be conducted for the study using a patient information sheet. Following this, their written informed consent was obtained. Clearance was obtained from the Institutional Ethics Committee prior to the conduct of the study (Letter ref: MCODS/14153 dated December 13, 2014, issued by Institutional Ethics Committee, Manipal College of Dental Sciences, Mangalore). The procedures employed in the study were in accordance with the Helsinki Declaration of 1975, as revised in 2000. World Health Organization (WHO) criteria were used for dental caries assessment. The dental examination was performed at the dental clinic, under artificial light, using a mouth mirror and WHO periodontal probe, by a single calibrated dentist. An experienced dental examiner conducted the entire training and calibration process. During calibration, scores were compared between the trainee and the experienced dental examiner, and the interexaminer reliability was good (Kappa coefficient = 0.94). The intraexaminer reliability was calculated after reassessing dental caries in a subsequent appointment, which was at least a week after the initial appointment in 10 randomly selected patients during the study (Kappa coefficient = 0.95). The teeth were given a code according to status: sound (s), decayed (d), filled (f), or missing due to caries (m). The total number of missing, filled, and decayed teeth (“dmft”) was calculated. A questionnaire on dental attendance pattern (frequency of dental visit, reasons for dental visit, and frequency of missed appointments) was completed by the accompanying mother. This questionnaire was examined for face validity and content validity by two subject experts (internal validity). The test–retest reliability of the questionnaire was assessed by administering it to 10 mothers, who were not included in the study, and was found to be good [Pearson correlation coefficient (r) = 0.86]. Dental anxiety among mothers was measured using Corah’s dental anxiety scale (DAS), a self-report measure of anxiety. The scale consists of four questions related to various aspects of dental treatment and measures dental fear on a scale from 4 (none) to 20 (extremely high). The scale has been widely used and psychometrically evaluated. The DAS scores were dichotomized into low dental anxiety (DAS < 13) and high dental anxiety (DAS ≥ 13). To assess the dental anxiety among children, the facial image scale (FIS) was used, which comprised of a row of five faces ranging from very happy to very unhappy. The children were asked to point at the face which they felt most liked at that moment. The scale was scored by giving a value of 1 to the most positive affect face and 5 to the most negative affect face. The scale has good validity, can be comprehended by children of preschool age, and is quick and easy to administer. The scores were further dichotomized into low-anxiety (FIS < 3) and high-anxiety (FIS ≥ 3) categories. Statistical analysis was performed using SPSS 16.0 software (SPSS Inc., Chicago, Illinois, USA). The association between maternal dental anxiety and child dental anxiety with mean “dmft” (total of decayed, missing, and filled teeth), “dt” (total number of decayed teeth), “mt” (total number of missing teeth), “ft” (total number of filled teeth) was analyzed using Student’s t-test. The association of maternal dental anxiety and child dental anxiety with frequency of dental visit, reasons for dental visit, and frequency of missed appointments were evaluated using Chi-square test. For all analysis, P-value <0.05 was considered statistically significant. Out of the 227 children, 44.9% were males and 55.1% were females, mean age being 4.5 years. The mean “dmft,” “dt,” “mt,” and “ft” of the children under study were 7.16 ± 3.83, 6.08 ± 3.66, 0.09 ± 0.42, 0.99 ± 2.03, respectively. Among the 227 mother–child dyads, 202 (88.9%) mothers had low dental anxiety, whereas 25 (11.01%) had high dental anxiety. Among the children, 140 (61.6%) presented with low anxiety and 87 (38.3%) with high anxiety. Maternal anxiety was significantly associated with a mean total number of missing and filled teeth in children (“mt” and “ft,” respectively). Mothers with high anxiety had children with a significantly higher number of missing teeth, whereas the number of filled teeth was significantly higher among mothers with low anxiety. Child anxiety had a significant association with the missing component. 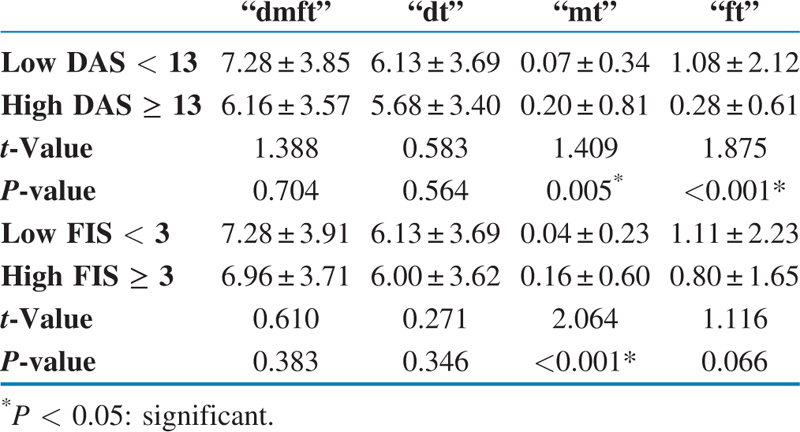 However, irrespective of the anxiety levels of mothers and their children, the decay component of the “dmft” (“dt”) formed a major part of the “dmft” score and did not seem to be affected by the presence of dental anxiety [[Table 1]]. Irrespective of the anxiety levels of both mother and children, the dental attendance was poor, as around 40% of the study population with a mean age of 4.5 years had visited the dentist for the first time. Most of the child patients in the study population had their first dental visit after a complaint such as pain in teeth (which was the most common reason) (47.1%), difficulty in eating, food getting stuck between the teeth, or when a cavity was perceived by the parent, irrespective of maternal and child anxiety levels. Only in a small proportion of children, the first dental visit was for preventive dental treatment. For the analysis of the association of dental anxiety with the frequency of missed appointments, 136 dyads were taken into consideration (because 91 children had never visited a dentist before) [[Table 2] and [Table 3]]. Maternal anxiety was not associated with dental attendance pattern [[Table 2]]. The frequency of dental visit of the child was significantly associated with child anxiety. Children with low dental anxiety visited the dentist more regularly compared to high-anxiety children. In addition, children with low anxiety had a significantly lesser number of missed appointments than children with high anxiety [[Table 3]]. The study results show that maternal anxiety was associated with “mt,” ft component of the “dmft” and child anxiety was associated with “mt” component. Among the factors related to dental attendance pattern studied, child anxiety was associated with increased frequency of missed dental appointments and decreased frequency of dental visits. The results indicate that mothers with more dental anxiety delay the seeking of treatment for decayed teeth of their children leading to early loss of primary teeth and a lesser number of restored teeth. Children with dental anxiety are more likely to have more traumatic dental treatments such as extractions. Traumatic experiences during dental treatment further increase dental anxiety leading to a higher frequency of missed appointments, thus leading to a vicious cycle. This explains the higher level of missing component of “dmft” among children with higher anxiety in this study. Hence, dentists should encourage the mothers to bring their children for frequent asymptomatic dental visits involving noninvasive treatments such as fluoride and sealant application, which can result in latent inhibition of the dental anxiety. No significant association was noted with untreated caries (“dt”), similar to an earlier study conducted by Wigen et al. Child anxiety but not maternal anxiety was associated with an increased frequency of missed appointments and a decreased frequency of dental visits. Contrary to this, maternal dental anxiety was shown to be associated with dental behavior management problem and dental avoidance behavior of their children in an earlier study. Most children with dental anxiety have behavior management problems. Failure to cope with the dental treatment due to the dental anxiety of the child can discourage the mothers from bringing the child for regular dental visits. The pain and unpleasant experience associated with invasive dental treatment such as dental extractions further aggravate the problem, and hence, they approach the dentists only when symptoms arise. This is reflected in the tendency of mothers to approach the dentist mostly for extractions and lesser for restorations, as seen in this study. In a study conducted previously, the dental anxiety of children of 5 years of age was associated with a symptomatic, irregular attendance pattern, a history of extraction, and having a dentally anxious parent. Another study concluded that dental fear in children is associated with missed appointments and a higher number of carious tooth surfaces. Thus, in clinical practice, children who miss dental appointments frequently can be those with high dental anxiety and visit the dentist for symptomatic dental treatment. The use of behavior guidance techniques by the dentist will help to alleviate child anxiety and improve the behavior which may help in enhancing the dental attendance of the child patient. Behavior guidance is a process of interaction involving the dentist and dental team, the patient, and the parent with a goal to establish communication, alleviate fear and anxiety which results in delivery of quality dental care, builds a trusting relationship between the dentist and child/parent and promotes a positive attitude toward oral health care. It does not include aversive methods which can be a part of behavior management, where the aim is to obtain patient cooperation to perform dental treatment effectively and efficiently. This study focuses on the dental anxiety of the mother–child dyad and its role in dental caries experience and dental attendance pattern. The results of the study imply that higher maternal and child dental anxiety can result in a visit to the dentist only when the child is symptomatic. This underlines the need to create awareness among mothers, regarding the effects of her own as well as child’s dental anxiety. Parents should be encouraged to seek dental treatment for their child not only when the child is symptomatic, but also on a preventive basis. This may render the dental appointments more pleasant to the child and improve the dental attendance pattern.As it is a questionnaire-based study, the memory or recall bias of the mothers may have affected mother’s responses, which is a limitation of this study. Due to the cross-sectional nature of the study, the temporal relationship of cause and effect cannot be established. It cannot be ascertained if higher frequency of missed appointments and higher missing component in “dmft” of children is due to intrinsic dental anxiety or if dental anxiety occurred due to a higher number of invasive treatments such as restoration and extractions. The dental attendance pattern and dental caries experience of the children in the study population may have been influenced by other factors such as parental knowledge and beliefs regarding dental caries, socioeconomic status, parental stress, and access to dental care., The study population was derived from a cohort who visited a dental clinic for treatment. For better generalizability, a population-based study should be conducted, taking into consideration other factors that can influence dental attendance pattern and dental caries experience of the child, to better understand the effects of maternal and child dental anxiety. Maternal dental anxiety is associated with higher number of missing teeth due to dental caries and lesser number of restored teeth in their children. Child dental anxiety is associated with higher number of missing teeth due to dental caries, lesser frequency of dental visits, and increased frequency of missed appointments. Child dental anxiety can influence the dental caries experience of the child and dental attendance pattern, whereas maternal anxiety can influence the dental caries experience of the child. Concept and design of study was by Drs. Shruti Balasubramanian, Suprabha B. Shrikrishna, Ramya Shenoy, and Arathi Rao; acquisition of data was by Drs. Shruti Balasubramanian and Suprabha B. Shrikrishna; analysis and interpretation of data was done by Drs. Suprabha B. Shrikrishna and Ramya Shenoy; Drafting the article and revising it critically for important intellectual content was carried out by Drs. Shruti Balasubramanian and Suprabha B. Shrikrishna; Final approval of the version to be published was given by Drs. Ramya Shenoy and Arathi Rao. The manuscript has been read and approved by all the authors, the requirements for authorship as stated earlier in this document have been met, and that each author believes that the manuscript represents honest work. Berkowitz RJ. Causes, treatment and prevention of early childhood caries: A microbiologic perspective. J Can Dent Assoc 2003;69:304-7. American Academy of Pediatric Dentistry. Policy on early childhood caries (ECC): Unique challenges and treatment options. Pediatr Dent 2016;38:52-4. Anil S, Anand PS. Early childhood caries: Prevalence, risk factors, and prevention. Front Pediatr 2017;5:157. Leong PM, Gussy MG, Barrow SY, de Silva-Sanigorski A, Waters E. A systematic review of risk factors during first year of life for early childhood caries. Int J Paediatr Dent 2013;23:235-50. Cunnion DT, Spiro A 3rd, Jones JA, Rich SE, Papageorgiou CP, Tate A et al. Pediatric oral health-related quality of life improvement after treatment of early childhood caries: A prospective multisite study. J Dent Child (Chic) 2010;77:4-11. Li Y, Wang W. Predicting caries in permanent teeth from caries in primary teeth: An eight-year cohort study. J Dent Res 2002;81:561-6. Wigen TI, Skaret E, Wang NJ. Dental avoidance behaviour in parent and child as risk indicators for caries in 5-year-old children. Int J Paediatr Dent 2009;19:431-7. Karibe H, Aoyagi-Naka K, Koda A. Maternal anxiety and child fear during dental procedures: A preliminary study. J Dent Child (Chic) 2014;81:72-7. Lara A, Crego A, Romero-Maroto M. Emotional contagion of dental fear to children: The fathers’ mediating role in parental transfer of fear. Int J Paediatr Dent 2012;22:324-30. Moimaz SA, Garbin AJ, Lima AM, Lolli LF, Saliba O, Garbin CA. Risk factors in the mother-child relationship that predispose to the development of early childhood caries. Eur Arch Paediatr Dent 2014;15:245-50. Goettems ML, Ardenghi TM, Romano AR, Demarco FF, Torriani DD. Influence of maternal dental anxiety on the child’s dental caries experience. Caries Res 2012;46:3-8. Goettems ML, Ardenghi TM, Demarco FF, Romano AR, Torriani DD. Children’s use of dental services: Influence of maternal dental anxiety, attendance pattern, and perception of children’s quality of life. Community Dent Oral Epidemiol 2012;40:451-8.
WHO. Oral health surveys—Basic methods. 4th ed. Geneva: WHO; 1997. Buchanan H, Niven N. Validation of a facial image scale to assess child dental anxiety. Int J Paediatr Dent 2002;12:47-52. Porritt J, Buchanan H, Hall M, Gilchrist F, Marshman Z. Assessing children’s dental anxiety: A systematic review of current measures. Community Dent Oral Epidemiol 2013;41:130-42. Milsom KM, Tickle M, Humphris GM, Blinkhorn AS. The relationship between anxiety and dental treatment experience in 5-year-old children. Br Dent J 2003;194:503-6. Davey GCL. Dental phobias and anxieties: Evidence for conditioning processes in the acquisition and modulation of a learned fear. Behav Res Ther 1989;27:51-8. Klingberg G, Broberg AG. Temperament and child dental fear. Pediatr Dent 1998;20:237-43. Klingberg G, Berggren U, Carlsson SG, Noren JG. Child dental fear: Cause-related actors and clinical effects. Eur J Oral Sci 1995;103:405-12. Clinical Affairs Committee—Behavior Management Subcommittee. Guideline on behavior guidance for the pediatric dental patient. Pediatr Dent 2016;38:185-98. Amin M, Perez A. Is the wait-for-patient-to-come approach suitable for African newcomers to Alberta, Canada ? Community Dent Oral Epidemiol 2012;40:523-31. Hooley M, Skouteris H, Boganin C, Satur J, Kilpatrick N. Parental influence and the development of dental caries in children aged 0–6 years: A systematic review of literature. J Dent 2012;40:873-85.